Recent research by West Health and Gallup discovered that American adults fear a major health event could lead to bankruptcy, that the U.S. economy is in significant danger and that the U.S. government is ill-equipped to address rising healthcare costs in a significant way. The study findings are based on a nationally representative survey of more than 3,500 randomly selected U.S. adults. The study revealed more than 3 in 4 Americans believe they pay 'too much' for healthcare relative to the quality of care they receive. Furthermore, 45% of the American public is concerned that a major health event could result in personal bankruptcy. Surprisingly, this concern remains relevant for Americans in the top 10% of earners. Of Americans who reported earning more than $180,000 a year, 1 in 3 were "concerned" or "extremely concerned" that a major health event could result in personal bankruptcy. But the anxiety induced by healthcare costs goes beyond worry over personal finances. Three quarters of Americans (77%) say they are concerned healthcare costs will result in significant and lasting damage to the U.S. economy. 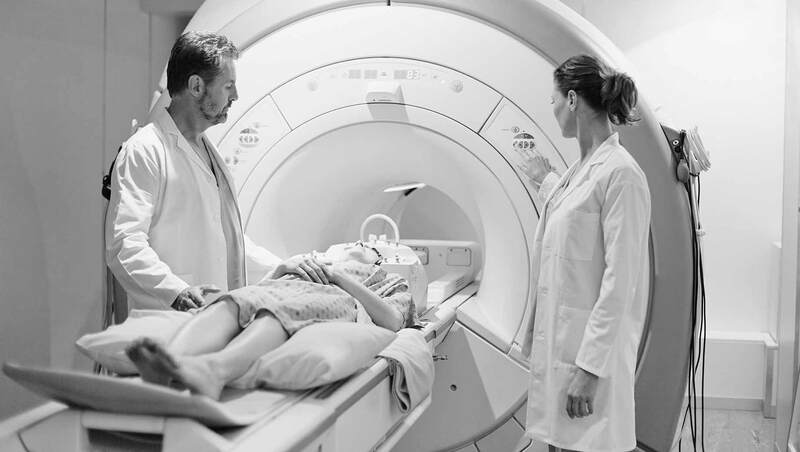 Despite Americans' concerns about U.S. healthcare costs, their perceptions about the quality of healthcare in the United States are surprisingly positive. 64% of Americans reported being completely or mostly satisfied with the U.S. healthcare system when it comes to meeting their needs and that of other household members. This optimistic outlook seems somewhat disjointed with key healthcare outcomes reported by the Organization for Economic Co-operation and Development or OECD. When compared with 36 other developed nations within the co-operation, the U.S. ranks 28th in life expectancy and 31st in infant mortality, two indicators considered important barometers of national healthcare quality. Furthermore, perceptions around quality differ by partisan affiliation. 67% of self-identified Republicans vs. 38% of Democrats believe the U.S. healthcare system is "among the best" or "the best in the world." But despite these opposing outlooks, both party groups report similar effects on their finances and health due to high healthcare costs. In the past 12 months alone, Americans reported borrowing an estimated $88 billion to pay for healthcare. 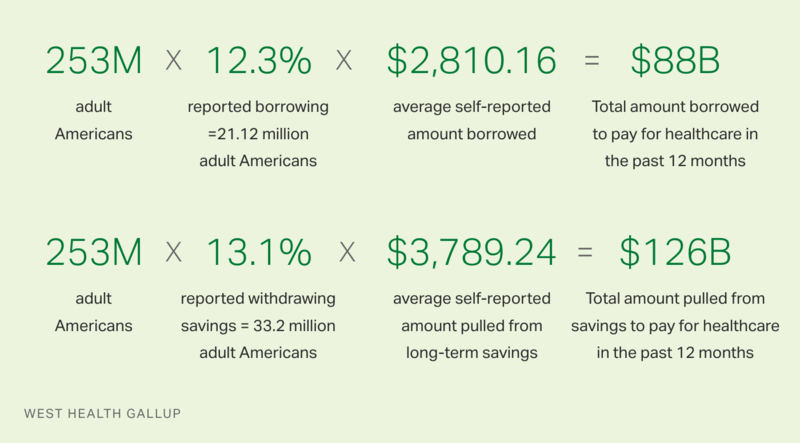 In the same time period, Americans reported heavy withdrawals against their future by tapping into long-term savings and retirement funds to the tune of $126 billion. "I'm a 61-year-old male married 40 years, no children. Both my wife and I are heavily considering our retirement and one of the biggest hurdles is our healthcare. We're hoping something positive will happen in our healthcare system, so we can enjoy our retirement." But perhaps more worrisome than the financial burden is the effect that the cost of healthcare has on the health of the American people. 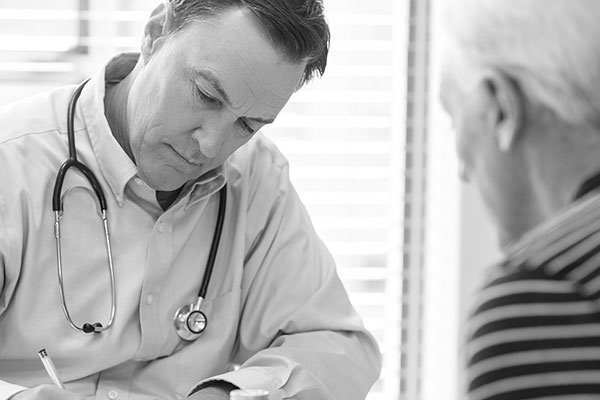 In the past 12 months, 38 million Americans elected to forgo a medical procedure, test or evaluation that was recommended by a physician, for a "somewhat"' or "very serious" medical condition because they didn't have enough money to pay for it. "My brother died because he didn't have access to healthcare. He didn't go to the doctor because he couldn't afford it and he had prostate cancer. I think he got Medicare, but then when he went to the doctor, it was too late." Americans currently have little optimism about future healthcare costs. Three in four (76%) predict that healthcare costs will continue to increase over the next two years. An overwhelming majority of Americans believe the government is not doing enough to ensure that prescription drug prices and healthcare costs, in general, remain affordable (77% and 74%, respectively). Americans have little faith that the government will achieve this goal; only 8% of Americans say they are confident that bipartisan legislation will be achieved to reduce the cost of healthcare. Ironically, this pessimism is uniform across party affiliation with more than two-thirds of Republicans and Democrats saying they are "not at all confident" elected officials will be able to work together to reduce costs. To learn more, download West Health and Gallup's full report: The U.S. Healthcare Cost Crisis.